What is SOA (Service Oriented Architecture) Software? If want to receive a more unified service oriented architecture (SOA) governance, then you should know that the SOA software can offer you a lot of help. This type of software is capable of providing a more unified SOA governance, API management and Cloud products that allow business organizations to have an easier time planning, building and running services and opening APIs. Service-oriented architecture (SOA) actually refers to a set of methodologies and principles that are effective in developing and designing software through interoperable services. You can expect these services to come out as well-defined and organized business functions that are established as a means of creating software components including discrete data structure and code pieces that you can reuse for other purposes. SOA also comes with design principles that are extremely useful during the systems integration and development stages. SOA is capable of performing a wide array of useful functions. One of these is that it offers information to consumers of IT services including web-based applications about any available services that are fully based on SOA. It is also a huge help in allowing numerous departments within a business organization to deploy and develop services based on SOA using various implementation languages to help clients access well-defined interfaces. SOA is also effective in integrating hugely dissimilar web-based applications while taking advantage of effective implementation platforms. It is also effective in defining an interface using functionality and protocols. Becoming a certified professional and expert in the field of service oriented architecture (SOA) is now greatly possible because Brainmeasures which is considered as the leading and the most indomitable online certification company at present is offering an SOA certification program. The SOA course accessible at Brainmeasures aims to help you acquire the most comprehensive knowledge about SOA, its major benefits and any tools that you need to make it work even better. With the help of this online certification course, you will get the opportunity to undergo an SOA training designed to mold your skills and expertise in the field so you will be able to better compete with all the other experts in the industry. The comprehensiveness of this SOA certification course makes it possible for you to learn more about the advantages of SOA and the many features and components that form part of it and that you can use in further improving its functionality. 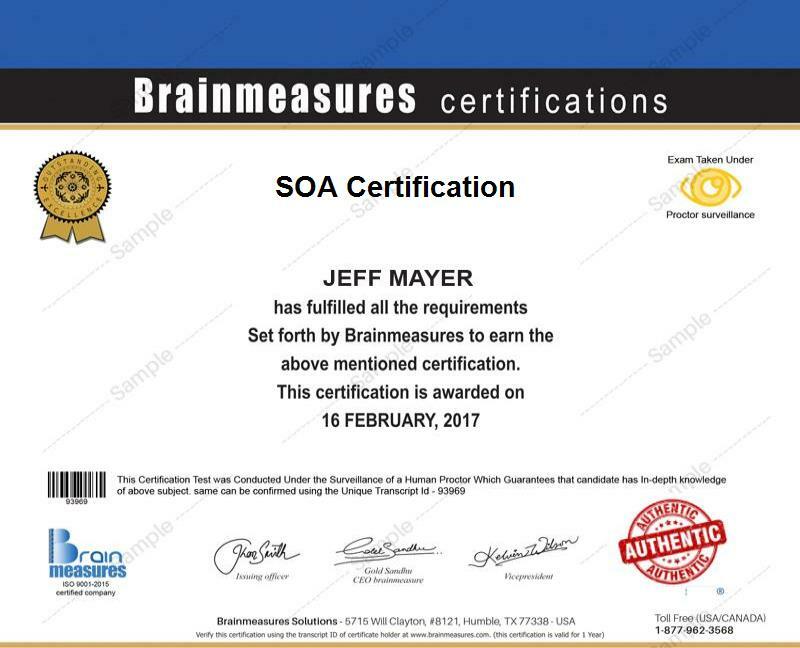 As soon as you receive your SOA certificate from Brainmeasures, you will become a certified SOA professional which is a huge help in further increasing the number of your job prospects as well as the level of your salary. Enrolling in the SOA certification course offered by Brainmeasures is extremely beneficial for you especially if you are one of those who wish to successfully gather relevant and accurate information and theories about this field and then putting them into better use. It is most suitable for business owners, regardless of its size and IT professionals including application development leaders, application integration leaders, application portfolio managers, web infrastructure and web services managers, application architects, project consultants and managers including those that are responsible in the implementation of SOA, apps and the Cloud. Receiving your SOA certification can also do you a lot of good especially if you are one of those who are dreaming to receive a higher salary. You can use your SOA certification to work as an SOA consultant which allows you to earn roughly around $105,000 each year. You can also use it to work as a software systems architect which is a huge help in earning within the range of $97,000 to $110,000 annually. If you work as an SOA architect, then expect to enjoy around $144,000 annual salary.